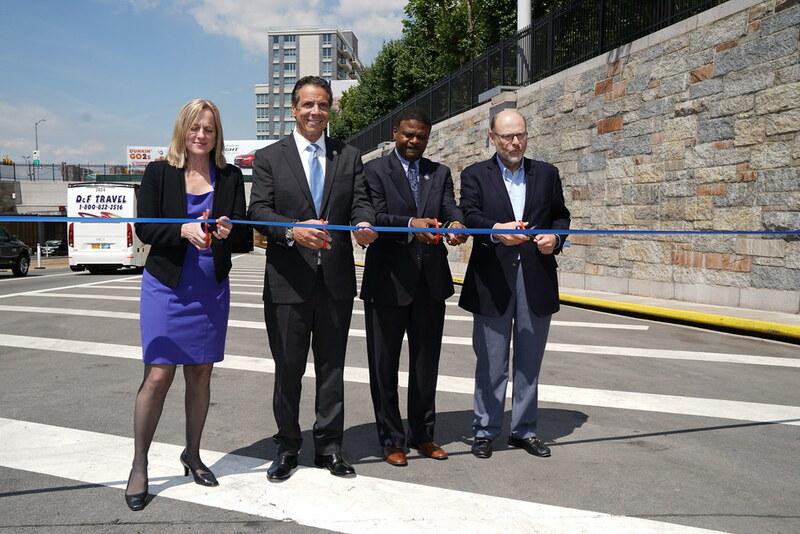 Governor Andrew M. Cuomo today announced restoration work at the Hugh L. Carey Tunnel and Queens Midtown Tunnel has been completed more than nine months ahead of schedule. The two Superstorm Sandy restoration projects completely overhauled the interiors and exteriors of the two tunnels - which were severely damaged by salt water from the storm surge - to improve resiliency, maximize public safety and ease traffic flow. "Superstorm Sandy was a wakeup call about the urgency to rebuild better, stronger and more resilient," Governor Cuomo said. "We undertook an unprecedented and expedited transformation of these two iconic tunnels and in the process modernized New York's infrastructure with cashless tolling - saving drivers millions of hours of travel time and creating a transportation system fit for the 21st century." MTA Bridges & Tunnels implemented long-term mitigation measures including installing massive 50,000-pound steel flood gates at all tunnel portals to protect against a FEMA 500-year flood event - four feet higher than the Sandy historic storm surge - as well as refurbished entryways. New state-of-the-art traffic control, communication, and drainage systems were installed on the interiors of the tunnels. Roadway lighting was replaced with new energy efficient LED lighting that will improve public safety. And new tiles, fire-rated ceiling boards, drainage gutters, pavement and catwalks were added. Plaza walls were restored and decluttered, removing conduits and unveiling original granite. At the Hugh L. Carey Tunnel Manhattan side, the decaying Morris Street Bridge has been replaced with a modern overpass that's ADA compliant. Reconstruction of the tunnels has also provided opportunities for innovations that are transforming New York's infrastructure like cashless tolling. Last September, Governor Cuomo announced the implementation of cashless tolling at all seven MTA bridges and two tunnels. Cashless tolling uses sensors and cameras on gantries that read E-ZPass tags and take license plate images to ensure drivers are tolled - otherwise drivers are sent a bill in the mail. Since undertaking a promotional campaign for E-ZPass, more than 94 percent of vehicles crossing MTA Bridges and Tunnels use E-ZPass to pay tolls, saving the average driver up to 21 hours of drive time per year. Since converting to cashless tolling, customers at MTA crossings have saved up to 3.9 million hours of travel time. 1.8 million gallons of fuel have been conserved - saving $4.7 million. The projects also included several critical public safety enhancements. Radiation detection equipment has also been installed at each tunnel entrance, and facial recognition equipment is currently being tested at the RFK Bridge. Situational awareness and security cameras have been installed at each tunnel entrance, including fixed cameras for traffic monitoring and incident management monitored by TBTA's Operations Command Center. Pan, tilt and zoom cameras that automatically move to capture potential security issues as part of TBTA's Electronic Security System were also added. In addition, 37 trucks - each weighing 10-tons and operated by the National Guard - are strategically deployed at all MTA crossings and ready to intercept possible security threats or terrorist attacks. During and after Superstorm Sandy, Governor Cuomo and MTA Chairman Joe Lhota toured the tunnels and saw firsthand the damage left in the wake of the historic near-9.5-foot storm surge that flooded the Hugh L. Carey Tunnel with a staggering 60 million gallons of contaminated salt water and the Queens Midtown Tunnel with roughly 12 million gallons of flood water. The salt water severely damaged all tunnel systems including electrical, lighting, communication, traffic controls, drainage and finishes. Governor Cuomo and Chairman Lhota oversaw the recovery efforts in getting the tunnels re-opened within weeks, obtained assistance from the U.S. Army Corps of Engineers and U.S. Coast Guard, and helped secure $404 million in FEMA funds to restore and rebuild both tunnels stronger and more resilient than ever before. Superstorm Sandy was a wakeup call about the urgency to rebuild better, stronger and more resilient. "We thank our customers for being patient while we completed this critical work," said Joseph Lhota, MTA Chairman. "By accelerating the projects, we completed the work over nine months earlier than planned and have completely modernized the tunnels, while also building them back stronger and more resilient." Congressman Jerrold Nadler said, "The devastation from Superstorm Sandy showed us the desperate need to make long-needed improvements to New York's infrastructure. New York City's place as an economic engine for both the region and state requires a modern and reliable infrastructure, and updating these two tunnels is a vital step to that end. I applaud Governor Cuomo for his hard work and dedication to this project, and believe it will help ensure our City is able to meet the demands the 21st century." Congresswoman Carolyn B. Maloney said, "Six years ago, our city was ravaged by Superstorm Sandy, and we are still recovering to this day. I am thrilled that part of that recovery—the restoration of the Queens Midtown Tunnel—is now completed, and nine months ahead of schedule! I am proud to have helped secure $404 million in Federal FEMA funds for this project. The repairs and improvements that have been made will keep us safer from future storms, while also improving traffic flow, reducing emissions, and considering public safety. Thank you to Governor Cuomo and MTA Bridges and Tunnels for seeing this project through to a successful completion." Queens Borough President Melinda Katz said, "Though Hurricane Sandy wrought havoc across Queens and so much of our city, thanks to Governor Cuomo's leadership and forward investments, we have come so far since then. He knows not the meaning of 'It can't be done.' He may be a 'Queens boy', but he's taken the entire state of New York so far. Just like many other infrastructure project initiated by the Governor, the Tunnels are now completed on budget and even ahead of schedule. With historic commitments, we are better, stronger, more competitive, and more resilient to weather any storms that may come our way." Manhattan Borough President Gale A. Brewer said, "Manhattan simply cannot exist without its transportation infrastructure and its links to the rest of the city and New Jersey. I commend the state and its partners for the early completion of work on the Battery and Midtown Tunnel. Whether it's wear and tear from the march of time or major damage from a catastrophic flood, government's first job is keeping our infrastructure in repair and keeping New Yorkers moving." The two tunnel restoration projects totaled more than $550 million and were largely funded by FEMA. To minimize impacts to the travelling public, all restoration work was integrated with other planned rehabilitation work as well as with the implementation of Cashless Tolling at both tunnels and the replacement of the decaying Morris Street pedestrian bridge at the Hugh L. Carey Tunnel.